Torque meter is available in two different versions: handheld meters or tabletop meters. 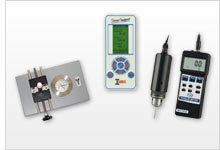 Torque meter have a wide range of applications. Handheld torque meter is mainly used for industry while tabletop torque meter is the ideal tool for laboratories. Our Torque meter come with a RS-232 port to transfer torque values to a PC or a portable computer. This is very helpful if you want to save the data and stand the chance to compare what you have measured afterwards. Another possibility is that you aim to do long-term-measurements. There the interface and the software are two very useful features that are given to you. Tabletop torque meters can be equipped with a printer (option). You can also order a ISO calibration certificate as an option. This ensures that the device has been calibrated and works perfectly including a measurement with only small deviances that can still be tolerated and do not influence the product's functions. We can offer you torque meters that can measure up to a maximum measuring value of 500 Nm.